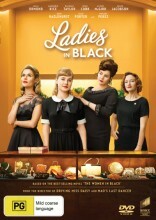 Shane Jacobson and Noni Hazlehurst star in the Ladies In Black DVD which is set in the summer of 1959 when the impact of European migration and the rise of women’s liberation is about to change Australia forever, a shy schoolgirl takes a summer job at the prestigious Sydney department store, Goode’s. There she meets the “ladies in black”, who will change her life forever. Beguiled and influenced by Magda, the vivacious manager of the high-fashion floor, and befriended by fellow sales ladies Patty and Fay, Lisa is awakened to a world of possibilities. 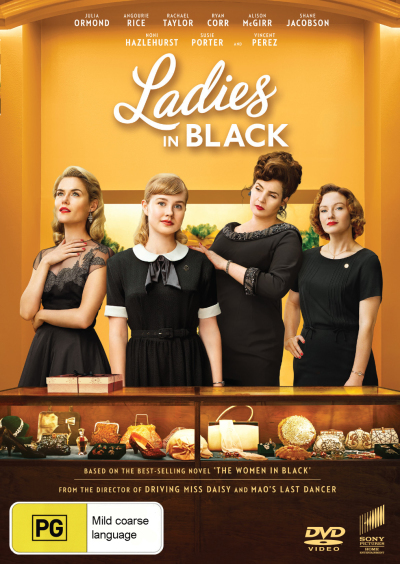 The Ladies In Black DVD stars Julia Ormond, Angourie Rice, Rachael Taylor, Ryan Corr, Vincent Perez, Alison McGirr, Susie Porter, Shane Jacobson and brilliant Noni Hazlehurst. Set in 1959/1960's Sydney, it is a walk in memories of the city. It manages to capture some of the attitudes of 'typical Aussies' at that time, and elegantly shows the growth in maturity of people's attitudes - particularly toward the new migrants who didn't speak English. Congratulations to Bruce Beresford and the cast. A few more light-delights like this would be welcome. The film is an entertaining, light hearted look at how things once were. It is set in a time when life was really much more black & white. It does raise some very relevant points about immigration & the value of it that continues to grow through time. All in all a delightful way to pass the time & well worth it. Click the button below to add the Ladies in Black to your wish list.